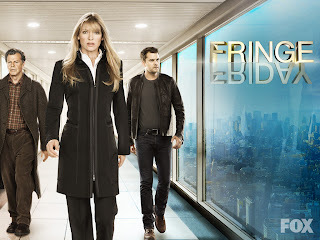 Paranormal Pop Culture: Fringe to end January 2013. Fringe to end January 2013. The end of Fringe is nigh. We knew it was coming, but it still hurts. The Fringe finale will air on Fox in a two-hour special event at 8 p.m. ET Jan. 18, 2013. It also happens to be Fringe's 100th episode. The date was announced on the show's Facebook page with statements from Executive Producers J.J. Abrams and J.H. Wyman, and Fox's Kevin Reilly. "Above all else, from the bottom of my heart, I would like to personally thank everyone involved with Fringe. From the most amazing fans, to our incredible cast, writers and crew, and our wonderful partners at Fox and Warner Bros. – we would not be here without you. It simply cannot be overstated how grateful I am for the ongoing and unconditional support we have received over the past five seasons. It has been both mind-blowing and humbling. I’ve always been a fan of science fiction, and to be able to tell this story about a family – a family that, through everything, fought together for survival – has been a highlight of my career. As we approach the final chapter, I can hardly believe it, and I’m just truly thankful for this unparalleled experience." "It has been an absolute honor to have been a part of the weird and wonderful world of Fringe. I will always owe the cast and crew for pouring their hearts and souls into every dimension of this series. Creating the show with Bob Orci and Alex Kurtzman was a joy, but watching it evolve over the years into such an imaginative, insane and heartbreaking ride is nothing less than a thrill. I am grateful to our blessed fans, and to Kevin Reilly and Peter Rice and everyone at the glorious Fox network for allowing Fringe to reach its bittersweet conclusion." Bittersweet indeed. I hate to see the show end, but as a fan, I am grateful we were given the chance to say goodbye to the Bishop Family and all their friends.